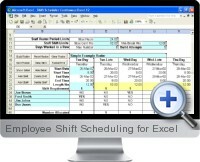 The Employee Shift Scheduler will build a roster structure to your specifications, allocate staff automatically, and generate a printable roster, all at the click of a button. It is compact and user friendly allowing you to add staff and shifts (maximum 150) with ease. Default values for continuous shifts mean that the only shift data required is the start date/time and length for the first shift, everything else is automated. For non-continuous or varying shifts you have the capacity to overwrite default data and structure shift settings to suit your specific requirements.